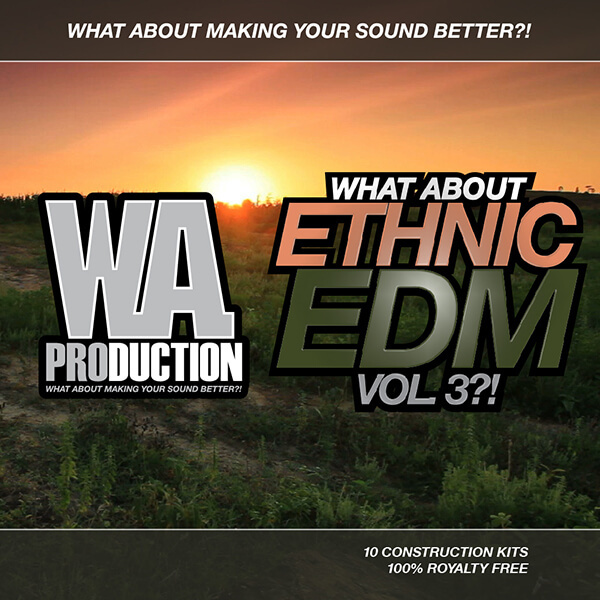 ‘What About: Ethnic EDM Vol 3’ is the third and freshest volume in this exclusive and well known series from W.A. Production which mixes Ethnic music with EDM. This product contains 10 huge Electro House and Melbourne Bounce Construction Kits, original ethnic instruments, vocals, EDM synths, FX, drums and MIDI, all 100% Royalty-Free. This music combination is well-known and very popular thanks to the biggest producers in the EDM scene such as Dmitry Vegas & Like Mike, Major Lazer, W&W, and many others. You’ll find Ethnic flutes, guitars, harps percussion and voices. In each track the Ethnic elements are perfectly mixed with the biggest and fattest EDM sounds and samples. Every single track has a different vibe and includes verses, builds ups and drops to offer you a huge range of possibilities. Big Room & Melbourne style drops are at the heart of this fantastic product. Drop tracks are rendered with sidechain and without to give you maximum freedom. Everything is supplied as 100% Royalty-Free and ready to drag and drop right into your mix. What About making your EDM tracks sound even more Ethnic?